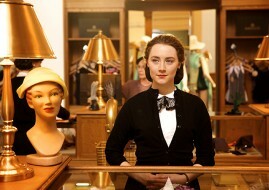 Saoirse Ronan has won the award for Best Actress at the prestigious New York Film Critics Circle Awards. The 21-year-old Irish actress was recognised for her role in the John Crowley-directed film Brooklyn and was presented the award by Liam Neeson. The film, which opens in Australia next month, tells the story of a girl struggling to adapt to her new life in New York after moving thousands of miles from home in the 1950s. The 21-year-old said it was the perfect role for her. She was born in the Bronx to Irish parents before her family moved back to Ireland when she was three-years-old. She joked after receiving the award that she was called ‘Saoirse from the Block’ by her friends. “I’m one of you” she said. “I am from the Bronx, after all. ‘Saoirse from the Block’ is what they call me,” she joked, referring to Jennifer Lopez’s Jenny from the Block. The New York Film Critics Circle is often an indication of potential Oscar nominations. The Irish actress is now third favourite to life the gold statuette behind Cate Blanchett for Carol and Brie Larson for Room, based on the book by Irish-Canadian author Emma O’Donoghue. Ronan recently made the US business magazine Forbes 30 under 30 list, which names the most successful young talent in the last year.